WHO DOESN'T LOVE A LITTLE SUNSHINE? Not only does it feel fantastic, but it also has numerous health benefits. 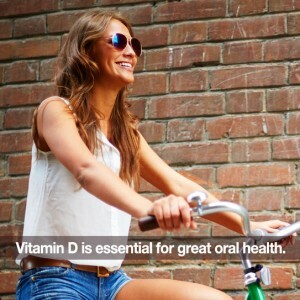 Sunshine improves our mood, our immune functions, and catalyzes vitamin D production in our bodies. One of vitamin D's major functions is moderating other vitamins and minerals—including calcium. Calcium fortifies our teeth and supports jaw and bone strength. That's why we fortify milk (a great source of calcium) with vitamin D.
Vitamin D also functions as an anti-inflammatory. Periodontal disease is the #1 cause of tooth loss in adults, and it's a result of inflammation of the gums due to harmful bacteria. Of course, we need to be careful about how much sun exposure we're getting. You don't need to sunbathe all day to get the vitamin D your body needs! Take this blog post as an excuse to go outside today and drink up a few rays.